©FAO/Giuseppe Carotenuto 23 July 2018, Rome - The complex relationships between forests and water must be recognized and understood in order to solve the world’s growing problems with water shortages, according to a report discussed at an event in World Forest Week at FAO headquarters in Rome. ‘Forest and Water on a Changing Planet: Redefining the Narrative’ reviewed a recent report from the International Union of Forest Research Organizations (IUFRO) which concluded that a growing global population and climate change are worsening water shortages. Part of the solution to those shortages involves understanding the connections between forests and water, and working to sustainably manage both. The IUFRO publication, titled ‘Forest and Water on a Changing Planet: Vulnerability, Adaptation and Governance Opportunities. A Global Assessment Report,’ was prepared by the IUFRO-led Global Forest Expert Panel (GFEP) on Forests and Water. The GFEP is an initiative of the Collaborative Partnership on Forests (CPF), which is chaired by Hiroto Mitsugi, Assistant Director General of FAO’s Forestry Department. The report had been released in mid-July at the United Nations High-Level Political Forum (HLPF) on Sustainable Development in New York by IUFRO. 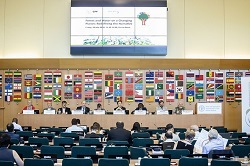 It convened last Friday’s World Forest Week event on forest and water with FAO. The publication emphasized how central water is to attaining the Sustainable Development Goals and the Paris Agreement on climate change, as well as the close links between water and forests. That connection is demonstrated by the fact that approximately 75 percent of available freshwater sources in the world come from forested watersheds. However, water is not often considered a priority in forest management and is often overlooked in international climate discussions, according to the GFEP report.